Adam Lambert took on emcee duties for this year's dance-themed "VH1 Divas" extravaganza, broadcast live Sunday night from Los Angeles's Shrine Auditorium, and the hosting newbie handled himself with Seacrest-like finesse throughout the two-hour concert. But he also sang more than any other host (or hostess) in "Divas" history, opening the show with a cover of one of his idols, David Bowie, and bringing down the house with a tribute to another of his favorite divas, the one and only Madonna. Adam, who once performed a Bowie medley on 2009's American Idols Live Tour, got the "Divas" dance party started right with a spectacular space-rave version of Bowie's "Let's Dance." It was time to put on the red shoes, for sure, but this celebratory performance certainly didn't give anyone in the Shrine any reason to dance the blues. After honoring the King of Glam, towards the end of the broadcast Adam took on the Queen of Pop, belting out Madonna's "Ray Of Light" while wearing a mystic zodiac tunic and flanked by yoga-pajama'd Burning Man dancers. Good times. 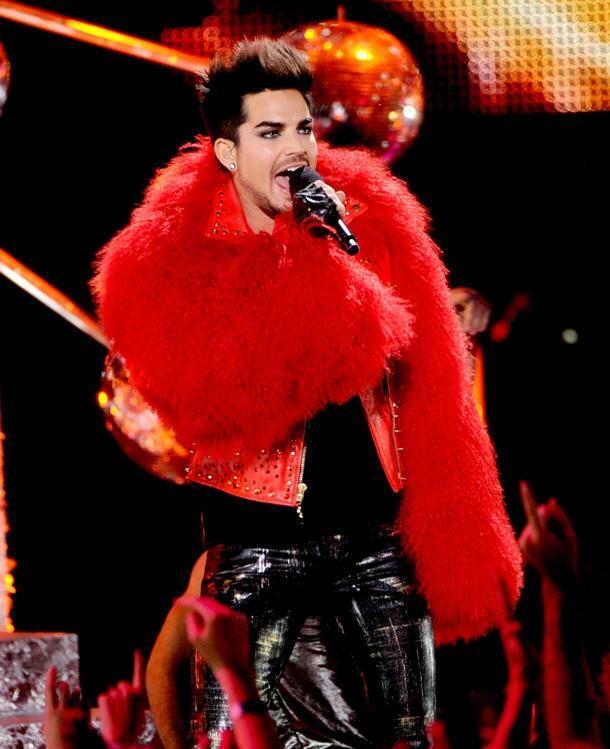 That Kabbalah-esque robe was something else, but Adam's best costume changes (and what would a Lambert-hosted "VH1 Divas" show be without a few costume changes?) came when he joined Kelly Rowland and Keri Hilson for their tribute to the late, great disco diva Donna Summer. That's when the "in-house divo" un-mothballed his famous furry coat designed by the Blondes--the one he wore this past summer while touring with Queen, and the one known to many diehard Adam fans as the "Elmo Jacket." But like a true diva, or divo, Adam underwent a costume swap mid-performance, soon shedding the faux fur for moto snakeskin. And he sounded fabulous in both jackets, of course. Hot stuff, indeed. Adam wasn't the only Idol to werk the "Divas" stage on Sunday. Newly engaged Original Idol Kelly Clarkson, sporting an enormous canary-yellow diamond on her left hand, breathtakingly performed her latest single, "Catch My Breath," and Season 6 winner Jordin Sparks joined R&B sensations Ledisi and Melanie Fiona for a moving tribute to her late Sparkle co-star, Whitney Houston. Jordin later hosted the show's official afterparty to benefit VH1's Save The Music Foundation. Adam Lambert - "Let's Dance"
Kelly Clarkson - "Catch My Breath"
Ciara - "Billie Jean"/"Got Me Good"
Demi Lovato - "Give Your Heart A Break"
Paloma Faith - "Picking Up The Pieces"
Miley Cyrus - "Rebel Yell"
Pitbull - "Don't Stop The Party"
Adam Lambert talks "VH1 Divas"